Pale or fade looking Corals? Tissue Necrosis? Algae outbreak while no Phosphate? No idea what to do next? Nitrate Zero, Phosphate Zero, or even both? Or do you just want to get to the next Level of Colorization and Reefing? 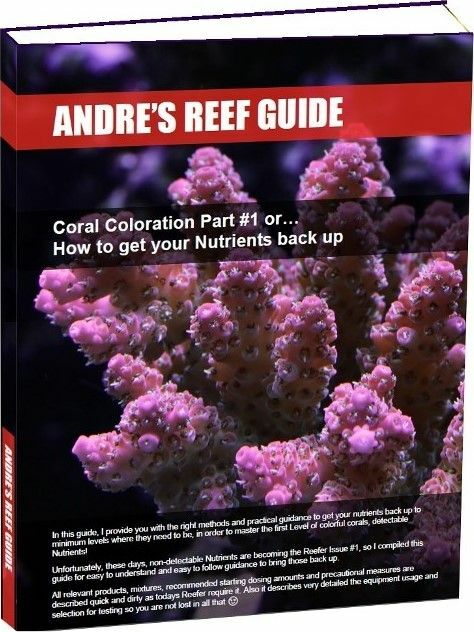 Then you need to read this practical hands-on Guide, to get the Colors of your Corals back, or at least learn how to get to the next Level of Reefing. Learn in this part especially, how to resolve a low, or worse, a Zero-Nutrient issue without making the issue worse which can happen easily!!! Nutrient control and Nutrient existence in the Reef Tank is the first MUST TO HAVE, in order to have beautiful colors on your Corals!!! Yes, if you have Zero Nutrients, you are going to face an issue sooner or later. And I will explain and give guidance how to detect if you truly have an issue or not. And if so, this Guide will tell you how to resolve that with very specific instructions and guidance in detail. This and my other Guides do provide enough “quick and dirty information”, how to get to the next Level of Reefing and sets the required Milestone to become the owner of a beautiful Reef Aquarium, as you sometimes see it in the Forums, where you just instantly start drooling………. I will also talk about the effects and manipulation of the bacterial biology and how to repair it from experience, not just theory. I have fixed so many Tank systems from average and beginner hobbyists recently, and the requests for help getting more, so that I will cover that with all my advice and hands-on guidance in my Reef Guides. It will also cover my personal Nutrient management to minimize the issue of undesired algae. This publication will not cover any Reefer basics, so you should know enough about how to operate a basic Reef Aquarium and maintain the Standard parameter. If you are that type of person, who really expect all the background details and chemical/biological explanation for everything that is being written and mentioned, this book may help you a lot to get the issue resolved, but won’t give you answers to what you are looking for, you would like to fully understand. After purchase you will receive an Email with your personalized link for download. If you do not receive this email within a few minutes after Purchase, please check your Spam folder.